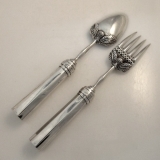 Substantial sterling silver salad servers made by Sanborn, from fine Taxco silver, c.1950. This rare and exquisitely detailed pair weigh an impressive 451 grams or 14.5 Troy ounces combined. The pieces measure 9 3/4" inches in length. The impeccable original condition and crisp detail, with no monograms, removals, repairs or alterations, make this an especially attractive offering. The soft, warm, original finish is present, with no buffing or machine polishing. 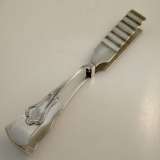 Rare Weishaupt 8oo silver asparagus tongs by Carl Martin Weishaupt & Sohne c. 1930. Founded in the early 19th century, Weishaupt was reknown for magnificent designs and expert craftsmanship. 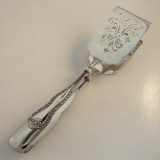 These lovely tongs are a perfect example of quality combined with artistry that made them famous. These handsome tongs measure an impressive 10 1/2" long and weigh 258 grams or 8.29 Troy ounces. The pristine original condition and crisp detail, with no monograms, removals, repairs or alterations, make this an especially attractive offering. The soft, warm, original finish is present, with no buffing or machine polishing. Sterling silver sandwich tongs, expertly crafted c.1890 and gracefully enhanced by gorgeous openwork and applied embellishment. They measure an impressive 10 1/2"in length and weigh 269 grams or 8.64 Troy ounces. The top of the handle is mongrammed SRN. The impeccable original condition and crisp detail, with no monograms, removals, repairs or alterations, make this an especially attractive offering. The soft, warm, original finish is present, with no buffing or machine polishing. Founded in 1908, Jenkins & Jenkins were famous for their exquisite repousse work. 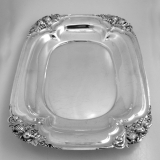 This stunning and impressive bread tray is a perfect example of what made their reputation and it was made in 1908. It measures 12 1/3" in length and has a width of 7 1/4". It weighs a hefty 352 grams or 11.31 troy ounces. Its elegantly monogrammed "1884 BHJ 1909" for a 25th anniversary. The immaculate original condition and crisp detail, with no monograms, removals, repairs or alterations, make this an especially attractive offering. The soft, warm, original finish is present, with no buffing or machine polishing. 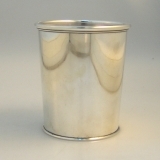 American sterling silver mint julep cup or beaker, by Krider & Biddle of Philadelphia Pennsylvania, c.1870 and retailed in Atlanta by Geo Sharp Jr. This handsome tapered, cylindrical beaker features applier beaded rims and stands 3 1/2" in height and has a diameter of 3 1/4", weighing a substantial 120 grams or 3.9 Troy ounces	The excellent original condition and crisp detail, with no monograms, removals, repairs or alterations, make this an especially attractive offering. The soft, warm, antique finish is present, with no buffing or machine polishing. 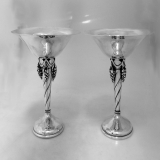 Exquisite pair of silverplated serving bowls with footed pedestals. This breathtakingly ornate pair were made by Tiffany & Co, New York c. 1885. The focal point is the resplendent repousse and openwork border, with scroll and foliate motifs. Each elegant bowl has a 8" diameter.The flawless condition and crisp detail, with no repairs or alterations, make this an especially attractive offering. The soft, warm, original finish is present, with no buffing or machine polishing. Gorham Coin Silver Water Pitcher Grape Motif Providence 1860. 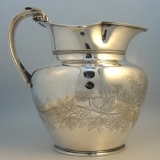 Magnificent American coin silver water pitcher, engraved with foliate and grape decorative border, c.1860. This substantial and majestic pitcher is made from American coin silver and has a purity of 900. The ample body is complemented by an regal beaded handle with applied foliate embellishment. The neck is adorned with a grand and decorative border. It is extraordinary piece standing 11 1/2" in height and weighing a massive 1145 grams or 36.81 Troy ounces. The exceptional condition and crisp detail, with no monograms, removals, repairs or alterations, make this an especially attractive offering. The soft, warm, original finish is present, with no buffing or machine polishing. 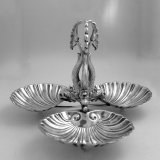 Rare and delightful 916 silver serving stand from Madrid c.1930 with a charming figural maritime motif. This lovely piece features graceful, highly detailed, dolphins and three beautifully fluted sea shells to serve nuts, candy or bonbons. It stands 5" inches in height and weighs 125 grams or four troy ounces. The impeccable original condition and crisp detail, with no monograms, removals, repairs or alterations, make this an especially attractive offering. 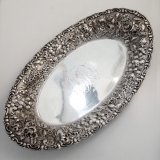 Masterfully crafted by Watson Silversmiths in c.1930, this impressive handwrought tray features beautiful figural fruit motifs, done in elegant repousse. This sumptuous handmade piece measures a generous 13.5" in length, and weighs a hefty 863 grams or 27.74 Troy ounces. The exceptional original condition and crisp detail, with no monograms, removals, repairs or alterations, make this an especially attractive offering. The soft, warm, original finish is present, with no buffing or machine polishing. Grand and colossal sterling silver punch bowl made by Elkington & Co, of Birminham England c.1897. Hand chased embellishment consisting of repousse figural angels, majestic scrolls, noble lions head handles, and regal decorative borders grace this treaure. They combine to create a piece that is as celestial as it is rare. This breathtaking Armada Bowl measures 11" in diameter, stands 7" and weighs an massive 1470 grams or 47.26 Troy ounces. The extraordinary condition and crisp detail, with no repairs or alterations, make this an especially attractive offering. The soft, warm, original finish is present, with no buffing or machine polishing. Rare pair of sterling compote dishes with stunning grapevine motif, masterfully crafted by silversmith, William De Matteo. Their sculptural, flowing, organic form is perfectly complemented by draping bunches of figural grapes and twisting vine inspired stems. Impressively crafted c.1950 in Alexandria Virginia. This exceptional pair are 6 1/2 " tall with a 7" diameter. The weigh a substantial 838 grams or 26.94 Troy ounces, combined. The impeccable condition and crisp detail, with no monograms, removals, repairs or alterations, make this an especially attractive offering. The soft, warm, original finish is present, with no buffing or machine polishing. 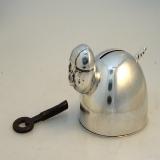 Charming 950 sterling silver piggy bank with working lock and key, c.1935. His cheeky face is as delightful as his whimsical little corkscrew tail. He weighs 129 grams or 4.14 Troy ounces. He measures 3" in length and 2 3/4" in width. The excellent original condition and clear detail, with no removals, repairs or alterations, make this an especially attractive offering. The soft, warm, original finish is present, with no buffing or machine polishing. 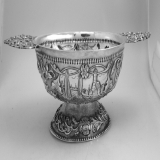 This exquisite continental silver brandy bowl is filled with old world European charm. It features beautiful figural handles and detailed pastoral scenes of farmers, cottages and a windmill. It is embellished with a repousse beaded border, on its edge, base and pedestal. This enchanting Dutch bowl was used for tasting and drinking brandy. Popular in Holland since the 17th century, brandy bowls were exported all over the world. It measures 6" in length, 2 7/8" in width, and stands 1 5/8" in height. It weighs 66 grams or 2.12 Troy ounces. The exceptional condition and clear, crisp detail, with no monograms, removals, repairs or alterations, make this an especially attractive offering. The soft, warm, original finish is present, with no buffing or machine polishing. Charming Dutch silver brandy bowl features figural cherubic handles, and delicate repousse floral and foliate border. It is adorned with various scenes of Hollandâ€²s motifs; a farm, windmill, ship, and church. It is beautifully embellished with a repousse beaded border, on its edge, base and pedestal. it was made by PvdW = Pier van der Woude who worked between 1898-1925 in the Frisian city of Sneek. This delightful Dutch bowl was used for tasting and drinking brandy. Popular in Holland since the 17th century, brandy bowls were exported all over the world. It measures 10" in length, 4 3/4" in width, and stands 3" in height. The impeccable condition and clear, crisp detail, with no monograms, removals, repairs or alterations, make this an especially attractive offering. The soft, warm, original finish is present, with no buffing or machine polishing. 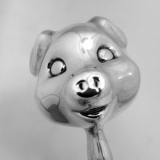 American sterling silver piggy baby rattle c.1950. This darling baby rattle measures 5 5/8" long and weighs 58 grams or 1.9 ozs Troy. The excellent original condition for a small dent on the back of the piggy′s head, clear, crisp detail, with no monograms, removals, repairs or alterations, make this an especially attractive offering. The soft, warm, original finish is present, with no buffing or machine polishing. 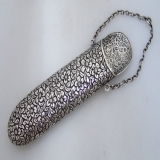 American coin silver floral repousse spectacles case c.1850. Charming detailed floral motif. This rare and unusual case measures 6" in length, 1 1/4" width and weighs 62 grams or 2 Troy ounces. The excellent original condition and clear, crisp detail, with no monograms, removals, repairs or alterations, make this an especially attractive offering. The soft, warm, original finish is present, with no buffing or machine polishing. 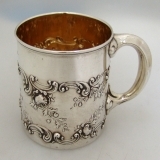 Repousse scrolls and floral motifs adorn this superb American sterling silver baby cup by Gorham Silversmiths, date marked for 1897. This beautiful cup measures 2 1/2" tall, 2 1/2" in diameter, 3 3/4" across the handle and weighs 89 grams or 2.9 ozs Troy. The excellent original condition and clear detail, with no removals, repairs or alterations, make this an especially attractive offering. Monogrammed Nina 1897 1961, the soft, warm, original finish is present, with no buffing or machine polishing. 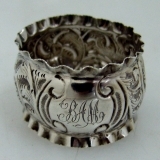 Continental coin silver napkin ring 1863. This beautiful ring measures 2 1/8" - 1 5/8" and weighs 25 grams or 0.8 ozs Troy. The excellent original condition and clear detail, with no removals, repairs or alterations, make this an especially attractive offering. Monogrammed C.R. i/l C.E. d.17.5.63, the soft, warm, original finish is present, with no buffing or machine polishing. 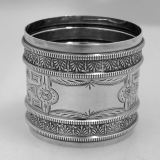 American sterling silver open work napkin ring, c.1910. This darling ring measures 1 7/8" - 1 3/8" and weighs 23 grams or 0.7 ozs Troy. The excellent original condition and clear, crisp detail, with no monograms, removals, repairs or alterations, make this an especially attractive offering. The soft, warm, original finish is present, with no buffing or machine polishing. Large handsome napkin ring from the master silversmiths of Wood Hughes, New York c.1870. 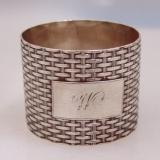 This bold and distinctive napkin ring features a heavily embossed all-over basket weave design with an applied rectangular engraved border and a simple cartouche with an elegantly monogrammed W. Dimensions: 1 3/4" - 1 3/4" weight 43 grams or 1.4 ozs Troy. The excellent original condition and clear, crisp detail, with no removals, repairs or alterations, make this an especially attractive offering. 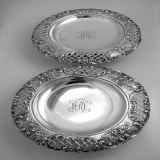 Monogrammed as described above, the soft, warm, original antique finish is present, with no buffing or machine polishing. American coin silver napkin ring c. 1880. Dimensions: 1 7/8" - 1 7/8", weight 23 grams or .7 ozs Troy. The excellent original condition and clear, crisp detail, with no monograms, removals, repairs or alterations, make this an especially attractive offering. The soft, warm, original finish is present, with no buffing or machine polishing. 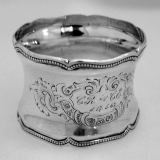 American coin silver napkin ring with delicate wine engravings, c.1880. This darling napkin ring measures 1 3/4" - 1 1/4" and weighs 27 grams or 0.9 ozs Troy. The excellent original condition and clear detail, with no removals, repairs or alterations, make this an especially attractive offering. Monogrammed Helen, the soft, warm, original finish is present, with no buffing or machine polishing. 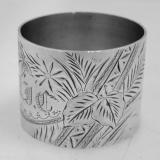 American sterling silver napkin ring with beautiful floral bright cut decoration c.1900. This elegant napkin ring measures 1 5/8" - 1 1/2" and weighs 44 grams or 1.4 ozs troy. The excellent original condition and clear detail, with no removals, repairs or alterations, make this an especially attractive offering. Monogrammed MJC, the soft, warm, original finish is present, with no buffing or machine polishing. 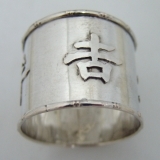 Chinese sterling silver napkin ring with applied Chinese characters, c.1945. This unusual napkin ring measures 1 7/8" - 1 1/4" and weighs 28 grams or 0.9 ozs Troy. The excellent original condition and clear detail, with no removals, repairs or alterations, make this an especially attractive offering. Monogrammed 1945 Richard Gerald Shanghai China, the soft, warm, original finish is present, with no buffing or machine polishing. 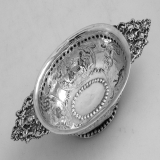 English sterling silver repousse napkin ring with pie crust borders, Birmingham 1904. 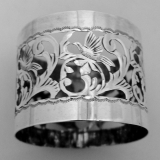 This beautiful napkin ring measures 1 5/8" - 1 1/8" and weighs 12 grams or .4 ozs Troy. The excellent original condition and clear detail, with no removals, repairs or alterations, make this an especially attractive offering. Monogrammed BAM, the soft, warm, original finish is present, with no buffing or machine polishing. 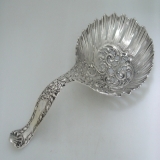 American sterling bonbonniere serving piece has a stunning openwork bowl with elegant scrolls and a beautifully fluted edge. It is marked Marshall Field & Co. It is a superb and ornate piece with lush and opulent repousse and cutwork embellishment. Quite large, very substantial in weight and a delightfully inspired work of art. This remarkable server measures 10 3/4" long and weighs 236 grams or 7.6 ozs Troy. The excellent original condition and clear, crisp detail, with no monograms, removals, repairs or alterations, make this an especially attractive offering. The soft, warm, original finish is present, with no buffing or machine polishing. 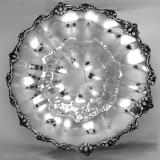 American sterling sectional silver bowl in the form of three bound leaves by acclaimed silversmith Alfredo Sciarrotta, c.1950. Sciarrotta was smuggled out of Italy into the US during World War II to work on submarine technology. 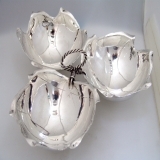 Afterwards he settled in Newport, RI and created a small line of hand-made sterling silver hollowware. These were retailed in his own shop and eventually by a few select stores including Shreve Crump & Low, Gorham, Bailey Banks & Biddle, and Cartier. Sciarrottaâ€™s designs are in several museum collections including the Smithsonian. This elegant bowl measures 10 1/2" long and weighs an impressive 534 grams or 17.2 ozs Troy. The excellent original condition and clear, crisp detail, with no monograms, removals, repairs or alterations, make this an especially attractive offering. The soft, warm, original finish is present, with no buffing or machine polishing. 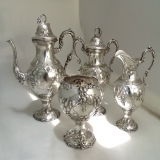 American coin silver four piece tea set with exquisite grape vine chased decorations done by master silversmiths of Richard Fisher & Francis Cooper, New York City, C.1854-1862. This regal and stunning set consists of a tea pot 12 1/2" in height, sugar bowl 10 1/2" in height, waste bowl 6 1/4" in height and the creamer which is 9" in height. Total weight is a substantial 2545 grams or 81.8 ozs Troy. The excellent original condition and clear detail, with no removals, repairs or alterations, make this an especially attractive offering. Monogrammed B in ornate period script, the soft, warm, original antique finish is present, with no buffing or machine polishing.